I thought I was going to lay low blog-wise while I was recuperating, but I had to blurt this one out. 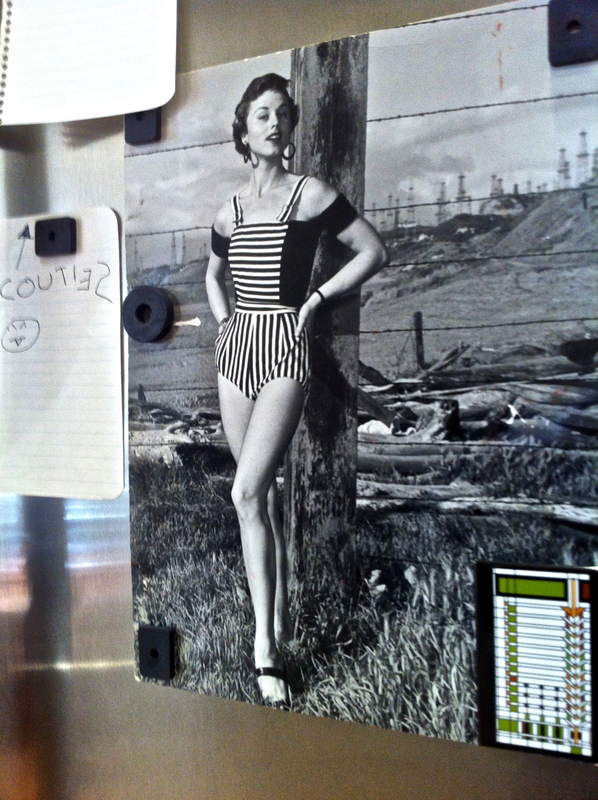 First a disclaimer; Dusty Anderson (model who married a director) pictured here in some kind of fifties romper in front of a Los Angeles oil field — is not my mother — I just like the photo — you know how I am about interesting photos. And yes, to the right is the adorable note I received from my beloved with my morning brew. Then another side-step, if you glaze over when people talk about their dreams, then fly away now, because this one’s a doozy. “Yes, sir,” said I — knowing as I did that I would have my agents send it over, that he (who spanned Old Hollywood to New Hollywood) wanted to still be in the game — making deals and wielding influence — that he was not my cousin — and that he had died the previous year. I like to hear about other people’s dreams but am absolutely without utility when it comes to their interpretation. Since then I enjoy such stories silently, while imaging pink elephants and evening primroses being woven into the narrative. I left out some details, mostly decorative, like layers of diaphanous lace at the windows, and the scion’s very narrow, very early 1960s silk tie. I could have done with some elephants and evening primroses. Damn, you’re a careful reader — and I have to say I take a great deal of comfort in your comment. I’ve been dreaming about Mom a lot recently. And, I will endeavor to subdue the cooties. 🙂 Thank you, George. Thank you, Edward 🙂 . ooooo, there’s something Brewing here we can feel it. I think what was brewing here were several strains of bacteria — that’s reportage straight from my dream-psyche. Don’t really know what it means, but HOLY MOSES, it was vivid.